It’s Friday night. You’re a day away from the weekly grocery trip and the only thing left in the freezer is frozen chicken strips. You don’t want frozen chicken strips. Your spouse doesn’t want frozen chicken strips. Frozen chicken strips can go to hell. You’re so sick of frozen chicken strips that you’d rather hit yourself in the face with a hammer than eat them again. You’d rather fight a bear. Hell, you’re so sick of frozen chicken strips that you would rather take your two kids (both under four) to a crowded restaurant on a Friday night than force yourself to chew that spongy, white, craptastic breaded chicken. Don’t wait until they are being little jerks before threatening to sell them. Define your terms before going to the restaurant. First, don’t actually threaten to sell your kids. They may not have developed the ability to process sarcasm yet. But really, coming up with punishments mid-tantrum, mid-dinner, underneath the table next to you as you chase your kid through a forest of other people's feet, just doesn’t work. Instead, let them know what you expect on the way to restaurant. Approach it in a nice way. “Honey, we’re going to go to dinner at the restaurant. I need you to stay at the table and eat your dinner. Ok?” Then, instead of just taking an “ok” as a response, ask them to repeat their obligations back to you. Then explain what will happen if they don’t follow through. Consequences you assign will vary, but in my experience they tend to be more thought out and rational when not being yelled while your child is eating spaghetti out of a stranger’s lap. I learned this one from a little restaurant in Moab, Utah. 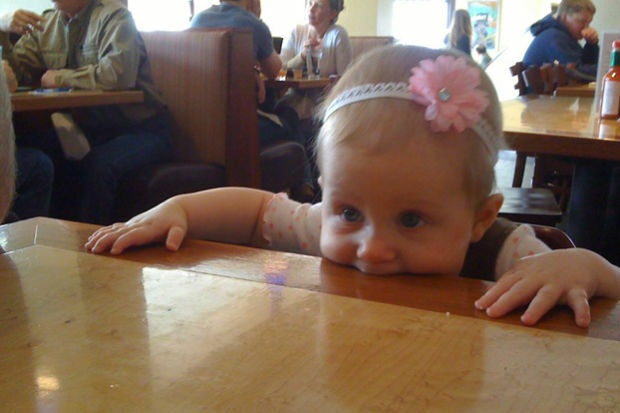 If you have a young toddler that still sits in a highchair, you know that the floor under the highchair tends to get more food than you do. Sure, the wait staff will clean all of it up after you leave, but why make them? We lay a square table cloth under the highchair, and after dinner is done, pick up the corners and bundle it up with everything in it. When we get home, we shake it out into the garbage and throw it in the washing machine. It is a nice you can do for the wait staff, and trust me, they appreciate it! Give the sugar packets, creamer, extra place settings, condiment bin, and permanent menu fixtures to your server. If it means that your dining area doesn’t end up looking like a tiny, adorable shoot out occurred once you leave, they will be glad to take them. Not only does this clear up plenty of table space for plates and cups to be scooted away from the kids, but it will also prevent the eventual tantrum that happens when your youngest bites into a creamer cup and it explodes all over his sister. You’ve cleared excess debris from the table. You’ve got the kids’ food coming. The kid in the highchair can drop anything he wants onto the table cloth you’ve set up and you don’t have to feel guilty. The server is super impressed with how prepared you are and brings you some free cream cheese wontons to thank you for your thoughtfulness. Now is the time to interact with your family. Ask your kids questions. Smile. Touch your spouse’s hand lovingly. You are the shining beacon of good parenting for everyone else in the restaurant to see. No one knows about last time - the tears, the screaming, the fork stabbing. All that matters now is that you don’t have to eat crappy chicken strips. All is well in the world. For now. Enjoy it. Have a cream cheese wonton. Did you enjoy this post? I bet you'll also like the Ask Your Dad Facebook Page. Come check it out! Free Cream Cheese Wontons for everyone!